Is your Double Chin This Cute? If not, then it may detract from a pleasant and balanced facial appearance, making you look heavier and older than you really are. 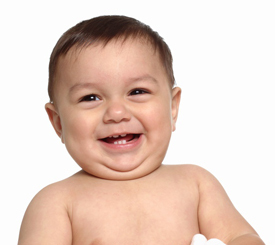 Excess subcutaneous fat under the chin may be genetic, caused by weight gain, or the result of aging; and it may persist despite diet and exercise. 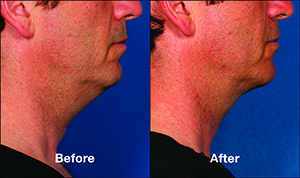 Many men and women are bothered by the excess fat under their chin, a condition that is medically referred to as submental fullness. A recent survey conducted by the American Society for Dermatologic Surgery (ASDS) revealed that 68% of people are bothered by excess fat under the chin/neck. To put into perspective how bothersome submental fullness really is, the same survey showed that 71% of people are bothered by lines and wrinkles around their eyes. So if you are unhappy with submental fullness, you are not alone. This excess fat under the chin has been an under-treated concern. The treatment options to address submental fullness have been very limited in the past, and liposuction of the submental fat has served as the primary treatment for many years. But that is changing… submental fullness can now be safely treated non-surgically by an injectable approach. Kybella (deoxycholic acid) is the first and only FDA-approved injectable medication that improves the appearance of moderate to severe fullness caused by submental fat in adults. The active ingredient in Kybella is deoxycholic acid, a naturally occurring bile acid molecule that aids in the breakdown and absorption of dietary fats. When injected into the subcutaneous fat under the chin, Kybella destroys the fat cell membrane, causing the cell to burst. Once the fat cell is destroyed, it is cleared by normal processes. 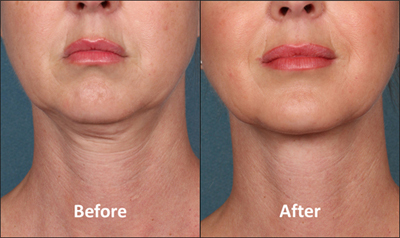 As the fat cells are progressively destroyed the fullness under the chin is reduced. The fat cells that are destroyed by Kybella do not return, and once the desired contour is achieved re-treatment is not anticipated (providing an individual’s lifestyle, diet, and body weight do not drastically change). The improvements in chin contour should therefore be long lasting. The best patient for a Kybella treatment is one who is in good health, has a moderate to severe amount of subcutaneous fat under the chin, without excessive skin laxity or prominent platysmal muscle bands. The Kybella treatment requires several treatment sessions, typically performed every four weeks. A series of injections are placed into the fat under the chin based upon the amount of submental fullness that is present. Many patients treated with Kybella experience visible contouring of their chin profile in two to four treatments, but some people may require up to six treatments. Dr Dembny is one of only a few select physicians in Wisconsin currently offering this new treatment. If you feel self-conscious or are embarrassed by the fullness under your chin, Kybella may be just what you need to improve your self-perception and feel younger and happier once again. Give us a call at 414-443-0033 to schedule a consultation to learn more, and to say goodbye to that dreaded double chin . This 35 year old woman (weight 115 pounds | BMI 20 kg/m²) received four Kybella treatment sessions. Post-treatment pictures were taken 12 weeks after her last treatment. 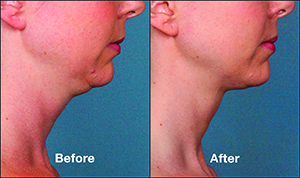 This 47 year old woman (weight 178 pounds | BMI 27 kg/m²) received four Kybella treatment sessions. Post-treatment pictures were taken 12 weeks after his last treatment.